﻿ News - 3/10 - My build of a Toyota 86 - Parts, Advice and Drama! First turbo’d FA20 motor to go boom! was just normal driving took off in first spun the tires regained traction shifted to second got to about 6k rpms or so and the motor shut off with a loud bang. poped the hood and smoked and steam rolled out. prior to that the car didnt feel like it had anywhere near 320whp like it was supposed to. the bov was staying open at idle causing the car idle at 1k rpms and choke and die randomly. i was waiting on a 12psi spring from fullblown to swap out the 7psi spring to see if that fixed the open bov at idle problem. TOYOTA INSTALLED it i hope to god they fix it if not i will kick someones a** i only put about 100 miles on the car after the install. i was going home to install a aem boost gauge/failsafe. i would liked to have known how much boost it hit at the time the motor blew up but guess we will never know. The next turbo’d 86 is also using the low mount AVO Turbo kit. No dyno results yet but here are some pictures. Since its launch last summer, the Toyota GT86 has received multiple awards for its no-nonsense, fun-to-drive philosophy. There’s no doubt that the Toyota GT86 is a special car, but as we recently reported, without major backing from on high within Toyota, it might never have happened. “As far as the convertible is concerned, there’s still some way to go before production. We’ve got many engineering challenges and not all of them are solved yet. “But from the outset, when we were engineering the coupé, we had the cabrio in mind. So we knew all the hard points that would be involved when it became an open top and bore those in mind. So the indexed windows are one highlight, also the way we laid out the rear suspension to allow for the folding roof. “Our exterior designer has already had in his mind having a cabrio version, so in his drawings he did a cut-off roof. The designer, Mr Brouchan, he likes convertibles. At the beginning of the project I wasn’t too concerned about a convertible version, but I would sneak up on him and he was always drawing a drophead. I would say, ‘you’re drawing a convertible, again!’. “Mass producing a sports car for a company like Toyota carries a big business risk and we’ve tried to mitigate that risk with our collaboration with Subaru. We say, ‘mitigate’ in one [easy] word, but we had to make some really tough decisions for us to realise this. Also, along the way, we investigated the possibility of a sedan [saloon] and a shooting brake. “Actually we tried to do this secretly but the executives found us out. They said: “what are you doing? Will you please focus on the coupé.” So that was our focal point and it was only with the success of the coupé that we were able to bring out the prototype of the convertible. It would never have existed without the support from you and the customers. “It’s just my personal dream that the GT86 could become a family like what BMW has done with the Mini family. I hope that happens. I also have five dogs myself and I would like to have them in the car, so a sports shooting break would be just right. “Actually I am flying to Munich after the [Geneva] motor show for discussion about the future cooperation with BMW. We are already discussing what we can do and the potential results of this collaboration. One of the things we learned from our cooperation with Subaru is how to bring these two different cultures together. Something like the GT86 sports car was particularly difficult in terms of collaboration, but what we can take from it is the experience of figuring out how we can get the obstacles to us working together for us. I am hoping that we can leverage this experience when we work with BMW. So just like we bought the GT86 out of our work with Subaru, I am hoping for a synergy effect with BMW that will result in a product that none of us could have imagined; something more than anyone expects. I would like that to be something like a sports car… I would even go so far as to say that for the collaboration to work we have to bring a product which exceeds all these expectations. “It is absolutely essential to have great connections with each other that go beyond just pure business logic. I was able to have remarkable encounters with people at Subaru and we had supporters behind us on the Toyota and the Subaru side. I’d even say these connections have to happen if the BMW collaboration is to work. If we carried along the lines of same-old, same-old, then nothing good will come out of this. A high-performance petrol-electric hybrid version of the GT86 sports car is under consideration at Toyota, Autocar can reveal. According to chief engineer Tetsuya Tada, all routes remain open to conjuring more performance from the rear-driven two-seater, with an eye on the creation of a faster and more focussed version of the acclaimed rear-drive coupe to be released later in the car’s lifecycle. Toyota took the wraps off a conceptual convertible version of the GT86 at the Geneva show, which is almost certain to make production. It nearly didn’t, however. “The management considered the GT86 very risky,” Tada said. “They wanted proof that the ’86 coupe would hit its sales targets before they would sign off on a convertible. An electric motor assist solution, Tada suggested, could provide a substantial low-rpm torque boost for the naturally aspirated engine without affecting throttle response or compromising on fuel economy or emissions. Similar to the ‘IMA’ system used on the Honda CRZ, the hybrid system would be much cheaper and simpler than the one used on the Prius economy car. The batteries, meanwhile, could be used to lower the car’s centre of gravity even further. The Toyota engineer suggested that the weight added by such a system could at least partly be offset, and that experimental underbody aerodynamic parts could be used to adjust the car’s handling balance should weight distribution be affected. “Our TRD tuning department has found it easy to take 100kg out of the kerbweight, and have developed certain underbody fins and plates that can be employed to alter the dynamic balance of the car, to increase or reduce oversteer at medium and high speeds. They have quite a pronounced effect,” he said. 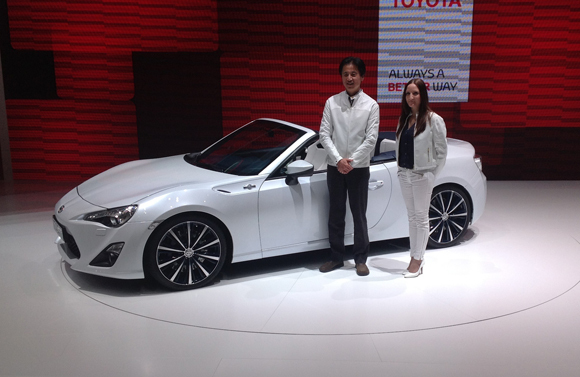 Here is a video and all the officially released images of the convertible 86.